As iconic as the Harley-Davidson Street Glide is, it’s hard to believe that the model is only 12-years old. In 2006, legendary H-D designer Willie G. Davidson set ink to the easel and out came the Street Glide – one of Harley-Davidson’s current top selling models. I spent my fair share of time aboard the 2019 Harley-Davidson CVO Street Glide, exploring the Midwest on my way to Harley-Davidson’s 115th-anniversary celebration in its hometown of Milwaukee, Wis. So, without further ado, we’ll hit you with the Fast Facts. 1. The air-/oil-cooled Milwaukee-Eight 117ci powerplant is a thing of beauty. This American V-twin has so much patriotic torque at its beck and call that it’ll make an American Bald Eagle shed a red-white-and-blue tear. The big twin thrums along with a throaty soundtrack as your dearest companion, giving more than enough power at a whack of the throttle—125 ft/lbs of torque at 3500 rpm, at Harley-Davidson’s word. 2. With a smooth throttle response at high or low speeds, the M8 117ci remains a user-friendly piece of kit, despite its sizeable displacement. A bit of clutch feathering is necessary when at parking-lot trolling speeds, but the pure joy of the 117ci is rolling on the throttle and exploring all six gears. 3. Based on the Milwaukee-Eight 114, the 117ci has a few tricks up its sleeve to get more power. Outside of the noticeable bump in displacement, Harley-Davidson engineers opted for a high-performance camshaft and high-airflow intake. In addition to the more aggressive camshaft and improved airflow, the engineers stepped it up to a compression ratio of 10.2:1. All told, it has resulted in a 12 ft/lbs of torque increase, and that’s something you can feel. The 117ci motor is also easy to spot, as it is the only engine with Blaze Red rocker boxes. 4. 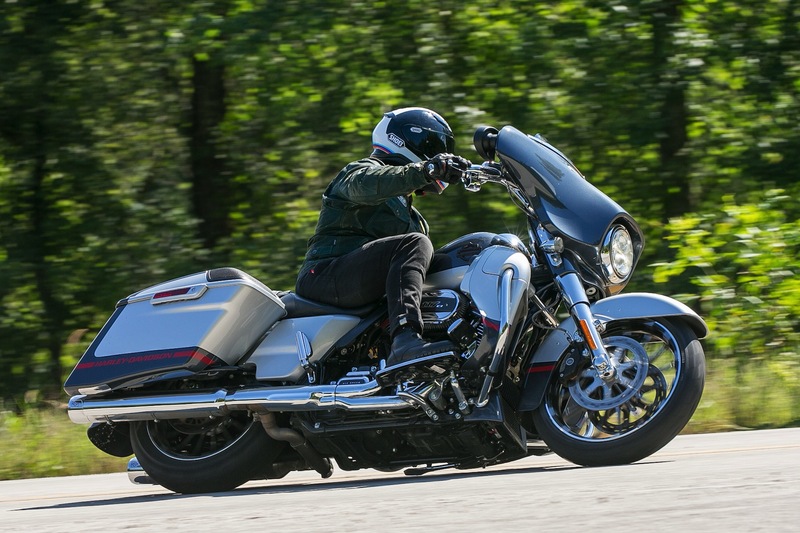 The 2019 Harley-Davidson CVO Street Glide 117 can hang with the best of them in the twisties. 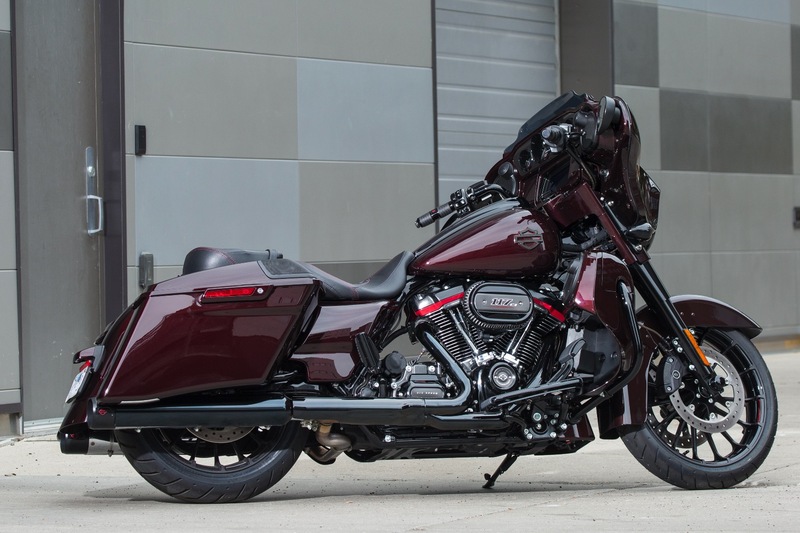 At 877 pounds, the CVO Street Glide doesn’t sound like it would be light on its feet. However, I assure you it is. With all the grace of a well-trained NFL linebacker, I slashed my way across back-country roads in the Midwest. Thanks to the 64-inch wheelbase and generous rake, the motorcycle remains planted in corners. Curiously, the Street Glide requires little input to get it pointed in the right direction. It’s an easy motorcycle to ride, which supports Harley-Davidson’s marketing team’s factoid that their touring bikes are most popular among new riders, women, and first-time H-D owners. 5. Showa suspension handles much of what the road offers. 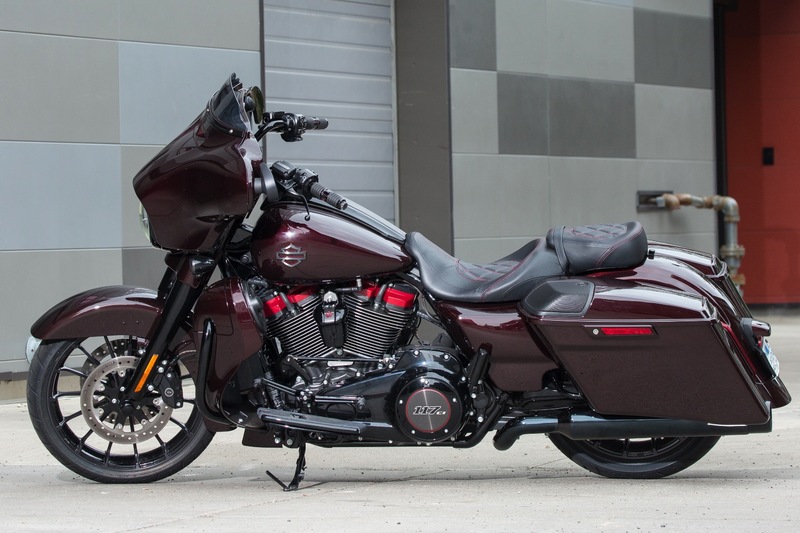 In a single word, the ’19 CVO Street Glide’s suspension is plush. The 49mm Showa Dual Bending Valve fork soaks up most everything in its path, while dual shocks with adjustable spring-preload round out the suspenders. In average use, the package does well, though a bit of energy from particularly weathered sections of Midwestern tarmac will inevitably be transferred into the rider. At higher cornering speeds, the Street Glide does a bit of a wiggle while on the edge of the tire, but I found dragging just a touch of rear brake stiffens up the chassis. 6. Comfy ergonomics and a low seat height make the CVO Street Glide 117 accessible for many riders. Featuring an approachable 27.4-inch seat height, the SG is downright homey. At 5’ 10” with a 32-inch inseam, I feel comfortable. The riser bars keep me in a neutral position, and the floorboards offer plenty of movement when on long stretches of highway. The Milwaukee-Eight engine is narrower than the Twin Cam, so, while the Street Glide is still a stout motorcycle, it has been narrowed considerably. Rider can more easily plant their feet to the ground or extend their boots as outriggers when parking. 7. Don’t fret, the Street Glide will come to a stop in a hurry. Unchanged for the model year 2019, the Street Glide returns with its previous setup of dual four-piston calipers clamping onto dual 300mm rotors up front. In the rear, a single 300mm rotor will continue to help slow the gentle-giant. Feel at the lever is progressive and a bit firm—not entirely uncommon for bikes of this size. The rear brake pedal can be modulated well, although I still feel that the angle is a bit steep for easy actuation. Of course, all touring models come with nonadjustable ABS and linked braking. 8. There are 68 liters of storage on tap, so you won’t need to pack light. Sure, a full dresser will give you more room, but with two saddlebags at your disposal, you will have plenty of luggage space for a weekend getaway or an interstate haul. 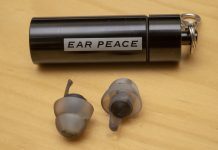 As before, the one-touch locking mechanism works quite well. The bags can quickly be removed without tools, should you need to change a flat. 9. The Boom! Box GTS infotainment received a significant upgrade this year. Standard on all Touring and Trike models, the GTS infotainment’s biggest change is a software update focused on giving it functionality in line with all our common touchscreen devices—pinch, drag, and swipe across the GTS screen to interact with it, even with your gloves on thanks to new Gorilla Glass. Also, the system features faster loading times over its predecessor and will be ready for use in roughly ten seconds. 10. Simply put, the Boom! Box update makes it a better system. Riders will be able to navigate via the touchscreen or through the hand controls—whichever you prefer. The Street Glide’s fork-mounted fairing places the screen within reaching distance, compared to the reach required on the Road Glide. Your smartphone can be paired with the bike to take calls, respond to texts, navigate, play music from your device, and almost whatever else you might need to do (it won’t mirror the screen). A final nifty update is the tire pressure monitoring system, which is always handy. 11. Apple CarPlay is supported on all Harley-Davidson Touring models. For riders who have given their faith to the Apple emblazoned brand, you’ll be pleased to hear that CarPlay is now a standard feature. Seamlessly link your Apple iPhone and do whatever it is you acolytes do. 12. The Harley-Davidson app is available for iOS or Android devices and will undoubtedly come in handy. The H-D app has plenty of fun features for owners to explore. By far, the most sensible addition is the ability to plan routes from your smartphone and send them to your motorcycle’s navigation system. It removes the need to sit with your motorcycle and punch information in via the touchscreen—you can hang out on the couch and build the perfect route. 13. Sit back, turn the stereo up, and make quick work of those highway miles. Three amplifiers with 75 watts per channel power six bi-amped speakers found throughout the CVO Street Glide; two speakers in the bag lids, two on the crash bars, and two in the dash giving you a real surround sound experience. They remain impressively clear at highways speeds. 14. 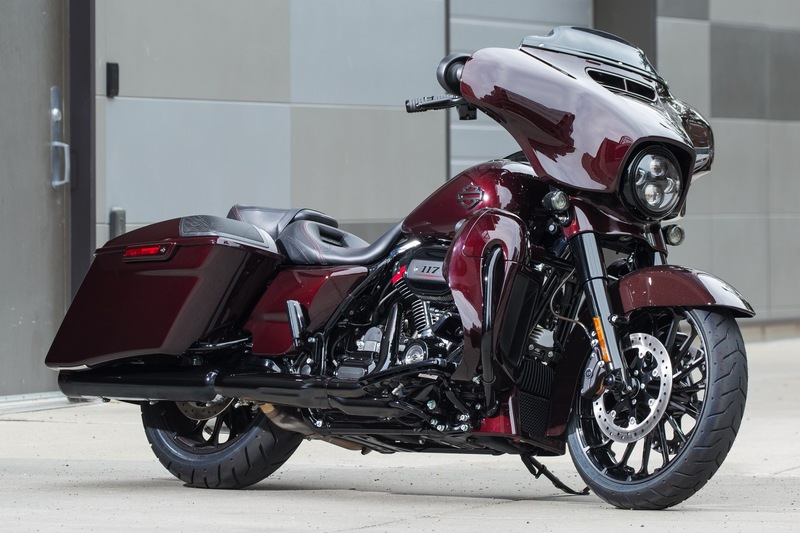 The 2019 Harley-Davidson CVO Street Glide 117 is American V-twin grandeur. When it comes to classing up the joint, the designers who oversee the CVO machines know how to get it done. The paint is stellar—three choices are offered—and the attention to detail is tough to match across any brand. If Harley-Davidson does one thing better than their competition, it’s turning heads, and that is precisely what you will be doing on the 2019 Harley-Davidson CVO Street Glide.